I was first introduced to Breyer horses in the late nineties when my grandmother bought me Henry the Norwegian Fjord for my birthday. I soon discovered Just About Horses, customizing, showing, and other aspects of the model horse hobby. 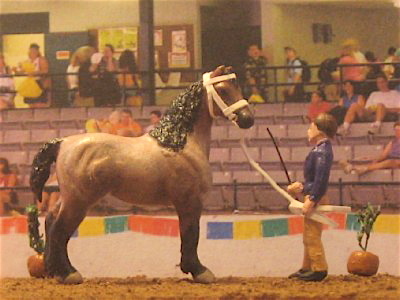 I already had a herd of toy horses, but Breyer showed me a new level of authenticity and variety, and I was hooked. 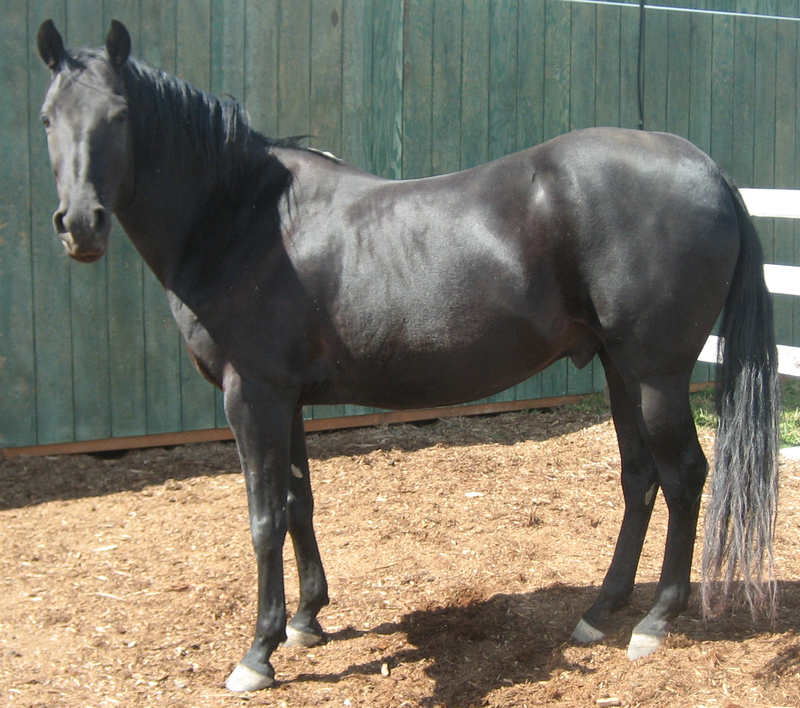 I collected Breyers for several years, subscribed to Just About Horses, tried my hand at showing, and dabbled in tack making and customizing without success. When I was twelve I promised my parents that I would sell my models to finance a real horse, and happily I got my wish in January 2002. As promised, I sold most of my models in order to buy tack and equipment for my beautiful, living, breathing horse. I still followed the hobby a bit and gained a horse or two, but my interest dwindled. By the time I went to college I had culled my Breyer collection to one model, an old grey Brighty which I bought at an antique fair. During college I had some health problems and found myself nostalgic, missing my horse, and looking for a new hobby that didn’t require too much energy. Around this time my friend, another ex-hobbyist, gifted me the Breyer micro mini trailer set. We were enchanted and spent a very happy spring break customizing micro mini (1:64 scale) and stablemate (1:32 scale) models. When I went back to school I started my return to the hobby. Despite my excitement, I remembered the disappointing aspects of the model horse hobby that I had experienced as a child- feeling disheartened with my tack and customs compared to what I saw others making and being unable to afford higher quality models and accessories. So although I was excited to collect models again, I wanted to lay down some strict ground rules about my intentions. Thus my commitment to do-it-yourself and “on the cheap” collecting was born. Every horse I own (with the exclusion of the aforementioned Brighty) is a custom of my own creation or a gift from a friend. I make all of my own tack and props. I strive to spend as little as possible on materials and so I am always looking for ways to recycle used or household items into hobby fodder, or barter for things I don’t make myself. 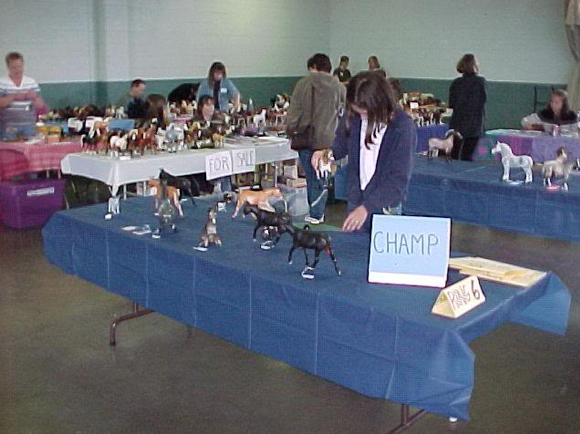 For me, model horse collecting and showing is a fun, social, and crafty hobby. I started writing this blog as a way to share my ideas and creations with others and contribute to the amazing online hobby world. I attend many hobby events around the Pacific Northwest and love to connect with other hobbyists. Hi, your blog is awesome! Do you collect Schleich horses, too? Thanks! I have a few custom painted Schleichs, but mostly I like to paint Breyers and artist resins. I have a few Breyers, but I mostly collect Schleich! Your painted Breyers look Awesome! I collect Shleichs and Breyer! Is there a tutorial on how to customise a Schleich horse? The only tutorials I have about Schleichs are this one about cutting them in half and this one about using modge podge to seal your work (that’s a crucial step). If you’re looking for more information about repositioning them, you might try searching on YouTube. For finishwork, I think you can generally use any model horse painting tutorial, as long as you’re sure to prime them first and seal with modge podge when you’re done.